Jeff Gerstmann is an Internet god, or at least that’s how it would have seemed if you visited any gaming site since the world caught wind of his sudden dismissal on Thursday, November 29. From the moment I heard the shocking news, I knew that this incident wasn’t going to disappear in any tidy fashion. Gerstman was one of the most senior journalists from Gamespot, and the rumor at the time was that the dismissal was influenced by a negative review he published for the Eidos game Kane & Lynch. Unfortunately for Gamespot, they were also running a massive ad campaign for Kane & Lynch at the same time. The juxtaposition of these two events led the gaming community to question Gamespot’s journalistic integrity. The gravity of the situation was clear. It was going to take some serious public relations work with the Gamespot community to smooth things over. But of course, in all their infinite corporate wisdom, CNET had their own idea on how to handle this publicity mess: Just ignore it. In hindsight, I’m sure they regret that decision now. The lack of communication from CNET, coupled with other unfortunately timed events, fueled the fire of confusion and anger by the gaming community. We can speculate endlessly as to why Gerstmann was fired: Perhaps Eidos was angered by his Kane & Lynch review, or perhaps it was a culmination of other behind the scenes events. In either case, CNET left the Gamespot community in the dark. Gamespot is one of the longest running online gaming sites on the net. Launched in 1996, its had more than a decade to build what many Web 2.0 sites are rushing to do right now, a strong and dedicated community. All of that community building effort was reduced to shambles the instant CNET fired one of the most well-liked personalities from the site for seemingly shady reasons, and with little to no explanation. 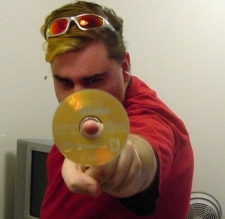 In retribution, the Gamespot boards, not to mention the comment sections and forums of other major gaming sites, were flooded with posts about Gerstmann. Joystiq started a Gerstmann-gate series of posts compiling the many reactions that started popping up online. It was no surprise to anybody that a great majority of the gaming dialog that weekend was all related to Jeff Gerstmann in some way. There was no real dialog with the Gamespot community until the release of the December 4 episode of their weekly podcast, the HotSpot. Needless to say, it was an incredible episode, and I’ll admit that the sheer amount of emotion in that podcast inspired me to write this piece. In the podcast, some of the remaining Gamespot employees gathered around for a heartfelt farewell to Gerstmann, and an even more emotional apology to the fans. They stressed several times that the Gamespot staff was a fairly close family, and this sudden move by their parent company knocked them all off-kilter. They also stressed that their family also includes the Gamespot reader community. It’s not how you respect your userbase, and the people that have supported us and turned is into what we are. This was exactly what the community needed to hear, and the fact that this message was delivered with such honesty made it all the more believable. It’s obvious now that the decision to remove Gerstmann came down from on high in CNET corporate, but it’s even clearer that they had no idea how tightly knit the Gamespot community was. In the podcast, they mentioned that CNET stated that they “didn’t understand the Gamespot audience” or the circumstance of the situation. They also mentioned the obvious disconnect between the corporate CNET office, and the day-to-day workings of Gamespot proper. It’s refreshing to hear them be so up front about something that we all pretty much assumed the day Gerstmann was fired. The lesson they need to learn for the future is that you simply can’t ignore your online community. This is especially true when you have one of the oldest and largest communities on the web. The trend towards transparency isn’t just a hip Web 2.0 fad. It’s a significant improvement on past communication models and will be the key to managing online communities from now on. Couple transparency with an attentive ear towards community dialog, and you have a recipe for a healthy online populace. Im a young Communication Specialist from India and write blogs on Social Media, New Technology Applications, Social Network and New Website Trends. I carry a Masters Degree in Communication/ Media Planning and PR from Cardiff University UK. I penned few articles on Web 2.0 and Best practices to create rich Web 2.0 User Experience. This is a great site love to hear more about it. Parul, thanks for the nice words, we hope you will come back again ,and I will sure check your site out. Devindra, thanks for your clear coverage of the issue. From what I can see, it seems like the journalist panned the game, the advertisers pulled out, CNET got wind of this and fired the reviewer without thinking about the ramifications in the Gamespot community. Corporations have a tendency to be really dumb. It’s a wonder they make money. Thanks for the kind words Skellie! This incident surely points to a failure within the traditional corporate communication model. Even though CNET isn’t a hip new Web 2.0 company, it seems like they’ll have to start thinking like one to really connect with their audience. I assume the same to be true for other big corporations that are trying to leverage a committed web audience. As an avid gamer all my life and a member of the Gamespot community, I was deeply saddened by the whole issue and deeply insulted when no clarification has been given. The text-based clarification did not cut anything and seemed informal, impersonal and unjustified. It was a good thing they released the video because I felt that the Gamepost staff was very saddened by the issue – whether or not Jeff was fired from upper CNET or from within Gamespot, sadness is still felt in the Gamespot community. My personal theory is the negative review + the advertisement. For CNET, it probably felt embarrassed that they are charging their client ridiculous amounts of money to put ads on Gamespot and ten have a reviewer flame at it.